I am pleased to announce that Virtual Law is available for pre-order through the American Bar Association’s website. It went to press yesterday, and will be published in April. Virtual Law will be exclusively available from the ABA for a month or so, and then will be released to brick-and-mortar and mainstream online booksellers. Virtual Law: Navigating the Legal Landscape of Virtual Worlds is a practical guide to emerging legal issues associated with virtual worlds. While the book should appeal to attorneys interested in these spaces, I wrote it with a mainstream audience in mind and made a real effort to explain the issues using terms that readers can parse without a law degree. Content creators, virtual property owners, virtual world providers, and virtual world users who are curious about the legal ramifications of their in-world activity should all find it both useful and accessible. It is also designed to work well in an undergraduate or law school course curriculum, featuring “Open Questions” at the end of each chapter that can be used as discussion-starters or possible essay topics. 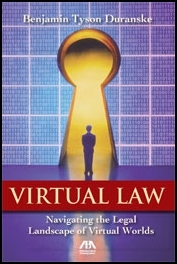 This book is an introduction to the emerging and intriguing world of virtual law. It examines current cases and legislation impacting virtual world providers and users, and makes predictions about the future application of current law. It addresses the application of intellectual property law, criminal law, property law, contract law, securities law, tax law, and civil procedure. The author provides clear and practical advice on how to create a virtual world presence for your practice or for your clients with virtual world connections. The book also includes extensive appendices listing in-world and web-based resources. If you are a member of the media, or if you teach a course where you would consider using this text, do not hesitate to shoot me an email. I’ll put you in touch with the ABA publicist, who can provide information about excerpts, bulk pricing, reprints, review copies, and interviews. Thanks, Kit. I had a blast writing it. The publicist works for the ABA, so it’s not that big a deal, but it is pretty cool. And I do have representation on another project right now, so this second career thing does seem to be working out pretty well — now I just need more time! When I add practice back in the mix later this year (still the plan) I’m going to be awfully busy, but I love both practice and writing too much to abandon either. Congratulations Ben!!! Awesome. I myself hope to make time to check it out. Awesome! Can’t wait to read it. How do I get a signed copy?!? I’ve never understood why US corporations don’t offer cheaper shipping methods. I remember trying to buy a baseball jacket once from MLB.com, it was a $90 jacket and they wanted ~$80 to ship it to the UK. I ended up getting it from eBay for about the same price, and the seller there managed to ship it for about $18 in 4 days. Very best wishes for sales! @7 – While I’d hate to suggest anything other than unbridled enthusiasm for an immediate purchase, I have to admit that I suspect international shipping will drop somewhat substantially when it goes to the mainstream retailers. I am in charge of New Media for the leading business newspapers/sites/wire services De Tijd and L’Echo in Belgium. Before asking for a review copy, I would just like to know whether your book is relevant for a non-US audience? @10 – A lot of the background material has international application (and indeed, is drawn from international sources) but the nuts-and-bolts legal analysis focuses on U.S. code and case law. Occurs to me to ask, now that you’ve moved substantially from offering a Service to creating Content: Will you be selling virtual copies of your book in Second Life? If not, why not? If you didn’t consider selling intangible versions before… and your publishing contract allows it… would you consider it now and offer an e-version or SL v-book? And if not, why not? I ask because of the interesting post made by Bruce Sterling a couple of days ago regarding “pirates” becoming “scavengers” as incentives dry up and content creation wanes; this position seemingly in direct opposition to Cory Doctorow, who, for those unaware, releases his books online for free and mostly promotes the activities of DRM hackers and the Pirate Bay. @12 – good question. Like most authors of books coming out of publishing houses (as opposed to books that are self-published) I have very little control over marketing and sales, and the ABA retains all distribution rights as long as they keep the title in print. They have proven quite flexible, however, and may well be willing to consider electronic sales. It certainly makes sense, given the subject matter, and I am not at all opposed to it. I’ll bring it up with them. I deeply hope you follow the suggestion given by scven on 23, March. Here in Brazil, this subject is still undiscovered. Because of it, if you want to study this topic and related ones you have to do in English. But the international shipping is very expensive, as pointed Darryl Woodford on 21, March. Despite the fact of U.S. law system is common-law, Brazilian market is promising. Virtual communities like second life, orkut, and similar are becoming ever more popular and law problems are emerging as well. As virtual and real lawyer I wonder for learning and knowing the entire material of your book, mainly the international application approach. @18 – I have gotten a surprising number of notes like this, and I want to thank you all. I’ve got emails from the Netherlands, France, Germany, Brazil, and a half-dozen other countries. I had no idea VB had so many international readers or that this topic had such a huge potential international audience even though the book focuses largely on U.S. law. I suspect the publisher did not either. I am scheduling a call with the publisher about this, and will try to get some better solution than the current one for international shipping. I’m even going to explore e-distribution for international readers. This is somewhat uncharted territory for the publisher, but I’ll do everything I can. Let me ask VB’s international readers who are interested in the book this — when it goes to Amazon (not too long from now) are you able to get a better deal on shipping that way, or is that just as expensive to order books via the U.S. based Amazon.com? Hi, I am a student at law student at Indiana University-Bloomington. I am writing an article about the potential applicability of RL identity theft law to virtual identity theft. Is there any way I can get an advance copy of this book? Please ignore my typo. Thank you. @20 – It’s being printed literally right now, so you could ask your library to order one. Alternatively, if you know a professor at your school who would evaluate it for potential use it in a class, shoot me an email and I’ll put the professor in touch with the right people at the publisher. As Benjamin will attest, I’m always the one jumping up and down saying that the world is bigger than the United States. When I did the review, this was heavily on my mind – but given that there is little in the way of precedent at international levels in such things, it is slim pickings (unless one of you wants to sue someone else for something). That said, I think the best ways to explain the international legal issues are that they are at least partially derived from internet legal issues, and that it is not necessarily as much of a legal question as it is an economic negotiation. @19 – Just returning to this, but yes Amazon US would be slightly cheaper. More importantly, when it goes to Amazon US, it also becomes available at regional affiliates like Amazon UK and various marketplace sellers who are even cheaper. @24 – great. I am really glad to hear that will help with international shipping. Actually, I just checked, and Amazon moved even faster than I hoped. It is there now, at a significant discount. They do not have a cover image up, the page count is wrong (it’s around 450, with appendices, not 250) and the publication date is wrong (they have it in October, and unless there’s something goofy with the distribution mechanism that I do not understand, they should have it in the very near future). I’m working on all of these issues, but there is a product page now, so that may be helpful for international readers. Also, I talked to the publisher, and they’re going to seriously consider e-distribution as well, which should help international readers too. I’ll keep on this and let you know what comes of it. Finally, a note of clarification. Readers who happen click on my name on the Amazon page will find a link to a book called “Waterdrum Science” that is available occasionally via Amazon Marketplace. That is a book my mother, Carolyn Petty, wrote and published in 1996. It is a guide for teachers who want to teach science through integration with an art curriculum, with a particular focus on Native American art, storytelling, and history. I did some proofreading and light editing for her, but Amazon has me incorrectly listed as an author. Anyway, credit where credit is due, that one is all my mom’s work!